Sign up to Dry July Australia 2018 and raise funds for Princess Alexandra Hospital, Brisbane. Fundraise for The PA Hospital and help us continue to provide a more comfortable experience for cancer patients during their time in hospital. The PA Hospital is the largest surgical oncology Hospital in Australia, treating over 150,000 cancer patients per year. The Hospital has a specialist cancer centre which includes dedicated inpatient beds and a day care unit, an apheresis unit (stem cell collection) and a new 14 chair day therapy unit. While undergoing treatment for cancer in Hospital, patients can experience many challenges, including long waiting periods between treatments. This makes what is already an extremely emotional and distressing time, even more difficult. To help address this, the PA Research Foundation raises funds through Dry July annually to fund a number of initiatives within the cancer services unit at the PA Hospital. These include comfortable, ergonomic chairs, free Wi-Fi, televisions, a reading area, and couches. Through the 2017 and 2018 Dry July campaigns, over $38,000 has been raised in support of improving cancer patients’ comfort, care and wellbeing while seeking treatment in cancer services at the PA Hospital. A major project completed thanks to the 2017 funds raised was the delivery of more than 100 new ergonomic chairs to the oncology outpatients waiting area. With up to 1000 cancer patients passing through this waiting area each week (with some spending up to 6 hours sitting between chemotherapy and radiation treatments), the new chairs have made a huge difference to patients’ comfort and wellbeing during this difficult stage in their lives. Division of Cancer Services Nurse Manager Sue Schoonbeek was very excited to see the new chairs arrive in 2018 and said that these are providing patients with much more comfort and safety whilst waiting for treatments. "Some of the older chairs had become incredibly worn which presented a safety issue, placing our patients at risk in an already vulnerable time in their life. "The new chairs installed are easier to maintain, and easier for patients to get in and out of, eliminating the risk of falling or getting an infection. 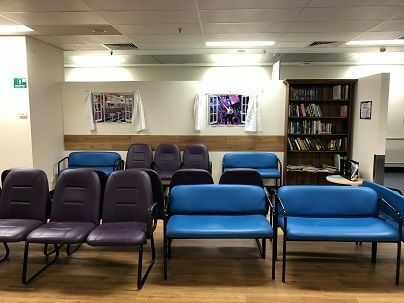 "Our patients selected the colours for the chairs; the whole process of providing comfort and care through Dry July is patient driven," said Sue. 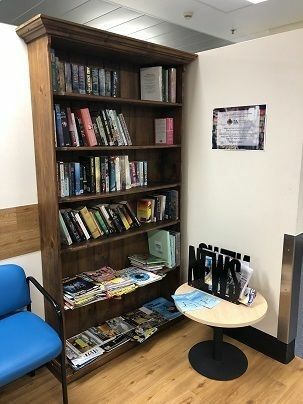 Continuing the theme of redecoration, funds raised through Dry July have helped to set up a community library in the waiting area with a bookshelf purchased as well as countless books kindly donated through the PA Research Foundation book drive. 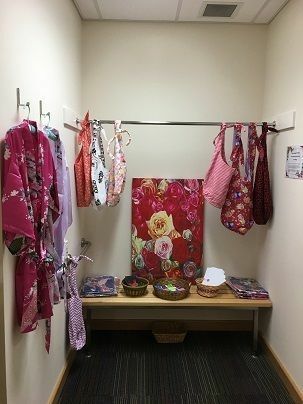 To complete a busy 12 months, the PA Hospital Cancer Services team set-up a private dressing room for breast cancer patients to choose a special care package to help make their treatment a less intimidating experience. The care package consists of a dressing gown more dignified than those already on offer, essential items such as writing utensils and a sling bag (kindly handmade and donated by PA Research Foundation supporters) that is soft and adjustable so that women during their treatment have a more comfortable alternative for their day-to-day necessities when they need it most. One patient to benefit from the PA Hospital’s refurbished oncology outpatients waiting area and care package is Sandy Belcher. Sandy has recently completed treatment for her second battle with breast cancer, 45 years after her first diagnosis at the age of 27. Sandy highlighted the significant changes in patient comfort and care since her first diagnosis. “When I was 27, I just went through what I was told to go through, but then I got discharged and there was nothing, there was not even a leaflet, there was nothing for where to go or what to do. “This time, it’s encouraging to see the great changes that have occurred in focusing on the patient’s comfort and care and making sure they are going okay. “It’s not an easy road – that’s for sure, and nobody would choose to go down it, but at least if you have to go down it – the system and the support are there… I’ve been really gobsmacked to be honest,” said Sandy. Sue and her team in Cancer Services at the PA Hospital are committed to ensuring that patients, like Sandy, receive those extra special items of comfort and care that to the outside world may seem small, but make an enormous difference to those going through such a difficult time in their lives. Funds raised through Dry July makes all of this possible – and your support makes an immeasurable difference to those facing cancer treatments at the PA Hospital. During the 2017 Dry July campaign, more than $13,000 was raised in support of improving cancer patients’ comfort, care and wellbeing at the PA Hospital. A major project which was completed thanks to the 2017 funds raised was the delivery of more than 100 new ergonomic chairs to the oncology outpatients waiting area. With up to 1000 cancer patients passing through this waiting area each week (with some spending up to 6 hours sitting between chemotherapy and radiation treatments) the new chairs have made a huge difference to patients’ comfort and wellbeing at a difficult stage in their lives. Division of Cancer Services Nurse Manager Sue Schoonbeek was very excited to see the new chairs arrive and said that these are providing patients with much more comfort and safety whilst waiting for treatments. To complete a busy 12 months, the PA Hospital Cancer Services team set-up a private dressing room for breast cancer patients to choose a special care package to help make their treatment a less intimidating experience. The care package consists of a dressing gown more dignified than those already on offer, essential items such as writing utensils and a sling bag (kindly handmade and donate by PA Research Foundation supporters) that is soft and adjustable so that women during their treatment have a more comfortable alternative for their day-to-day necessities when they need it most. Sandy highlighted the significant changes in patient comfort and care since her first diagnosis and the PA Hospital is significantly leaders in this field. “When I was 27, I just went through what I was told to go through, but then I got discharges and there was nothing, there was not even a leaflet, there was nothing for where to go or what to do. “This time it’s encouraging to see the great changes that have occurred in focusing so definitely on the patient’s comfort and care and making sure they are going okay. “It’s not an easy road, that’s for sure, and nobody would choose to go down it, but at least if you have to go down it – the system and the support… I’ve been really gobsmacked to be honest,” said Sandy. Sue and her team in Cancer Services at the PA Hospital are committed to ensuring that patients, like Sandy, receive those extra special items of comfort and care that to the outside world may seem small, but mean a huge difference to those going through such a difficult time in their lives. Funds raised through Dry July help make all of this possible and your support is making a big, big difference to those facing cancer treatments at the PA Hospital. 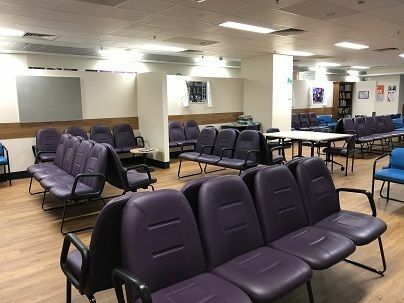 This year, funds raised through Dry July will go towards renovating patient waiting areas into interactive spaces to make the sometimes 5 hour waiting periods pass a little easier and installing more comfortable seating. 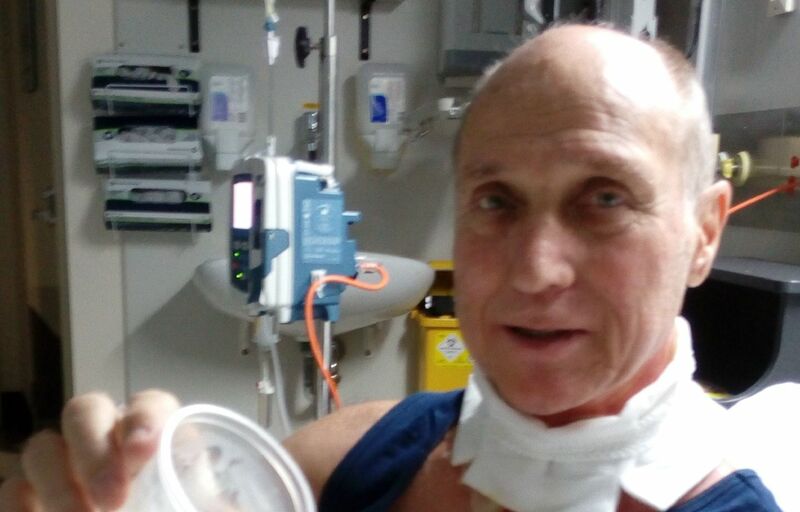 A patient who has recently spent a considerable amount of time at the PA cancer centre is Mike Stott who had to relocate to Brisbane for treatment of Squamous Cell Carcinoma of the Tongue. By supporting Dry July at the PA Hospital, you are helping to ensure patients like Mike feel as comfortable as possible at the hospital during such a difficult time in their lives. Mike Stott, a Cartographer from Cairns, noticed that a lump in the left side of his neck had formed during August 2016. He wasn’t feeling ill or suffering from any side effects, but worryingly, the lump was not going away. Mike’s doctor placed him on a course of antibiotics to see if it would clear a possible infection, however, this was to no avail. Further referral visits for X-Rays, blood tests, biopsies, scans and exploratory surgery revealed that Mike had Tongue Cancer (Squamous Cell Carcinoma of the Tongue). His oncologist said that it was a result of a virus he had as a child. After further hospital consultations with specialists in the oncology units in Cairns, Mike was required to relocate to Brisbane to commence a sustained 8-week treatment schedule of radiation and chemotherapy at the PA Hospital. Mike and his wife Trudy arrived in Brisbane on Sunday 4th December after a 3-day drive from Cairns. The following day, his treatment schedule was arranged on his first trip to the PA Hospital. He was to receive radiation treatment daily each weekday and chemotherapy once per week on a Wednesday. Speaking about that first day, Mike said: “Monday saw us leave for the hospital, it was our first day at the Cancer Council Lodge and we saw many patient residents waiting for the courtesy bus for their trip to their selected hospital. This was our first confronting moment as a lot of patients appeared in a bad way. Mike’s radiation treatments were short in duration, however there were other things being done in between times including talks on chemo awareness and diet, seeing speech therapists for tongue exercises, receiving physiotherapy and further blood tests. The PA Hospital was fast becoming Mike’s new second home. The chemotherapy days for Mike were a tough slog. He and Trudy would generally arrive at the hospital between 8:30/9:00 am for tests and to see his oncologists before spending numerous hours in the patient waiting area prior to his chemotherapy treatment. Some days, Mike would not leave the hospital until 8:00pm as he still had to receive his radiation treatment on chemotherapy days. “Chemotherapy involved 4 hours sitting in ‘The Chair’, being pumped full of saline and the chemo drug. The chairs are extremely comfortable with electric back and foot recliners,” said Mike. As treatment progressed, Mike began to suffer from the common side effects such as nausea, lack of appetite, excess build up of phlegm, pain, weight loss and broken sleep. Mike recalls Tuesdays or ‘Torturous Tuesday’ as the worst day due to it being the last day of the chemo week. During Mike’s final week of treatment, ‘Severe Monday’ as he refers to it as, occurred. His condition began to deteriorate due to the increased dosage of drugs and by Tuesday his temperature was up to 38.1 and his white blood cell count was down. Mike was admitted to hospital as an inpatient with 24 hour care for the next two nights. He had his final chemotherapy treatment on the Thursday from his hospital bedside which was, “a nice way of having it as I slept all through it!” Said Mike. After his final radiation treatment on the Friday, Mike was allowed to take his ‘thermo plastic body mask’ home with him. “I will get it painted in the Avatar colours and call it … ‘The Big Cavatar’,” said Mike. The battle wasn’t over for Mike after his treatment finished. The following week, Mike’s white blood cell count was lower than before as well as his neutrophil count. He spent the week in hospital before being discharged on the Friday afternoon. This was short-lived however as he was back in hospital for a further 7-days due to “the neutrophil counts moving up and down like a YoYo,” according to Mike. 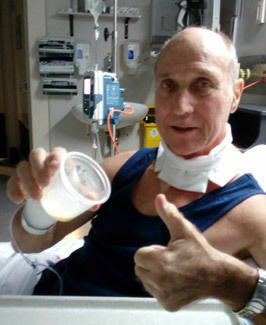 Finally, on Wednesday 8th February, 2017, Mike received the all-clear from his radiation oncologist to travel back home to Cairns on the Saturday. He was forever grateful for the care that he received during his treatment. Mike was booked in for a return visit to the PA Hospital on Tuesday/Wednesday 11-12th April for his 3-month post treatment PET scan to report on any evidence of residual cancer. He had the scans on the Tuesday and returned on the Wednesday for the results. “This was the most anxious week of my life, with so much hope pinning on a positive outcome,” said Mike. “Trudy and I jumped for joy and got quite emotional – we had to ask the oncologist to allow us a moment which he fully understood. “Some of the nurses in the oncology unit heard and came to see us with hugs and well wishes all around. Mike credits his wife Trudy for the incredible support, love and care she showed to him during his time at the PA Hospital, and of course since returning home. “Trudy wasn’t finishing her days until about 10pm (everyday). She was very busy driving me in and out of the PA hospital. Doing daily grocery/fruit shopping to get the freshest of all, and also depending on what I felt I could eat. Receiving specialist medical treatment for cancer patients is both a harrowing and daunting experience. Patients and their family members spend a considerable amount of time in the cancer centre awaiting treatments and for many, this is a daily ritual. The PA Research Foundation - using funds raised through the Dry July campaign - is helping to make the time spent at the cancer centre as comfortable as possible. To date, Dry July at the PA Hospital has: helped fund free WiFi access for patients, developed an e-Education program to provide up to date information for patients prior to treatment and installed flat screen televisions across cancer services’ waiting areas to help pass the time. 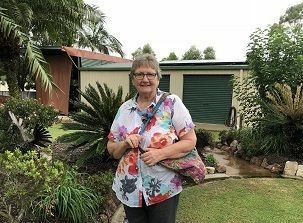 “Monday saw us leave for the hospital, it was our first day at the Cancer Council Lodge and we saw many patient residents waiting for the courtesy bus for their trip to their selected hospital. This was our first confronting moment as a lot of patients appeared in a bad way. The PA Hospital in Brisbane has 77,000 patient visits annually receiving radiation treatment. The hospital will use money from Dry July to install 2 data projectors in each of their 9 radiation treatment rooms to easy patient anxiety and provide a more comfortable experience. In addition, the hospital is using funds to purchase a further six scenic cubical curtains to be installed in cancer services wards for patient therapy and comfort, and a stainless steel water cooler for patients to access while waiting in cancer services for appointments.